Once Yellowstone National Park ends its productive summer season, it prepares for its scenic winter tourism market. From December to March, twelve or more feet of snow is delivered to the park and surrounding areas. This transforms the region into a winter wonderland. During this time, Yellowstone National Park is only open to oversnow travel atop paved roadways that are buried under a deep frosty blanket. The best way for most of us to explore the park is with either a snowmobile or snowcoach tour. Snowcoach tours have become the most popular way to discover Yellowstone's expansive beauty. When launching your travels into the park from West Yellowstone, Montana, a variety of options and amenities will become available to meet your specific tour needs. 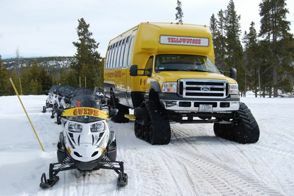 Snowcoach tours involve custom built snow-vehicles that can carry between eight to twelve passengers. Tours are typically about seven hours long. In addition to a specific itinerary, your snowcoach tour also sends along a specially trained interpretive guide. This guide will offer current information and interesting facts about Yellowstone Park's history, geology, wildlife, and current events while guiding the snowcoach along a designated route. These guides are also very helpful in pointing out the best photo opportunities along the way. Which snowcoach tour should I take? West Yellowstone's vibrant community is filled with established snowcoach tour companies and services. If you have specific tour needs  including special accommodations for a large party or for passengers with disabilities  be sure to make these known to a Brandin' Iron Inn staff member or your chosen snowcoach tour provider prior to the day of your tour. While on your tour, don't be afraid to ask questions or form discussions  these tours are very interactive! Guides will help you capture that perfect photo opportunity along the tracks, and will lead you on an up-close peek at Yellowstone's fascinating geothermals. You're bound to find a tour you'll love in West Yellowstone, Montana, so take one of these popular tours, or create your own. 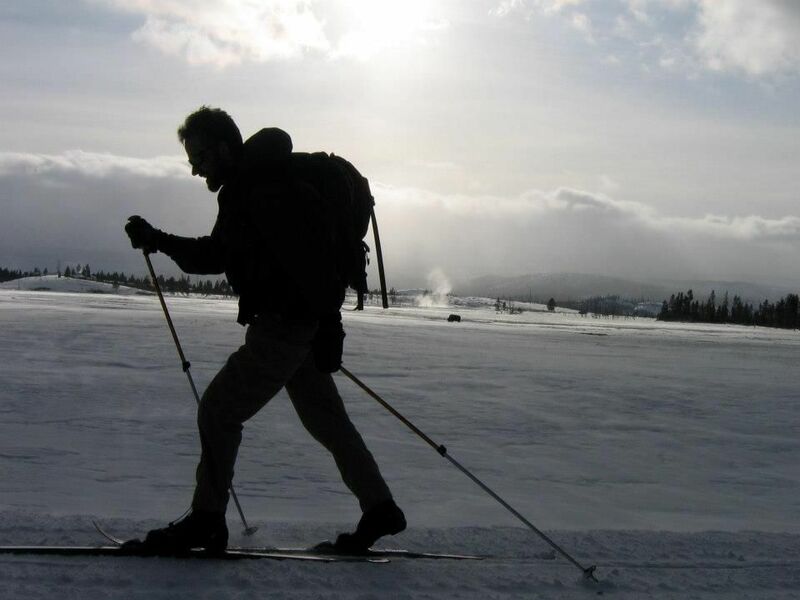 Early snow travel in Yellowstone National Park was powered by skis or snowshoes, reserving exploration for only the bravest of adventurers. The year 1948 brought the first instance of motorized travel within Yellowstone National Park. That year, snowplanes  which were wingless, airplane shaped vehicles with skis  were introduced. In 1955, the first generation of snowcoaches, called Bombardiers, were used in the park to carry passengers on winter sightseeing tours. At the time, these snowcoaches (produced by Bombardier, a Canadian company) resembled Volkswagen Beetles on steroids. They were originally equipped with two tank like tracks and large steering skis. By the mid 1970's, large passenger vans with various forms of track systems were introduced. Compared to the awkward and uncomfortable Bombardiers, these new generation snowcoaches provided a more warm and comfortable ride for visitors. From 2001 to 2012 snowcoaches evolved to minibuses and midsize buses. These were being converted into luxury track vehicles. These vehicles featured large viewing windows, bucket seats, better PA systems, and plenty of headroom. Largely responsible for today's snowcoach tour market, these types of snowcoach tours now outnumber all other forms of winter transportation in Yellowstone Park. In 2013, Yellowstone National Park officials launched a pilot program to test a type of low-pressure balloon tire that could potentially replace the track systems. The U.S. National Park system asked The Brandin' Iron Inn's own Randy Roberson to lead this program because of his extensive experience with snowcoaches over the years. Not only did Randy help in the development of the luxury snowcoaches from 2001 through 2016; from 2013 through 2016 he was instrumental in developing all of the fundamental technology that is now industry standard for snowcoaches with low pressure tires. Today the use of these balloon tires provide a quieter ride, better fuel economy, and are easier to maintain. Upon successful completion of the trial in 2016, Yellowstone Park officials converted 75% of its fleet to balloon tires, marking the most significant improvement of snowcoach technology since 1955. In 2017, snowcoaches are state-of-the-art touring vehicles designed for optimal comfort. When booking your snowcoach tour in Yellowstone Park, expect a luxurious, warm ride through a gorgeous winter landscape loved by many. Yellowstone's most popular snowcoach tour, The Old Faithful Tour includes a trip through Yellowstone Park's major geyser basins en route to the legendary Old Faithful geyser. Try this tour for a peek at the Park's 10,000 thermal wonders and impressive wildlife along the trail's riverways (spelling). 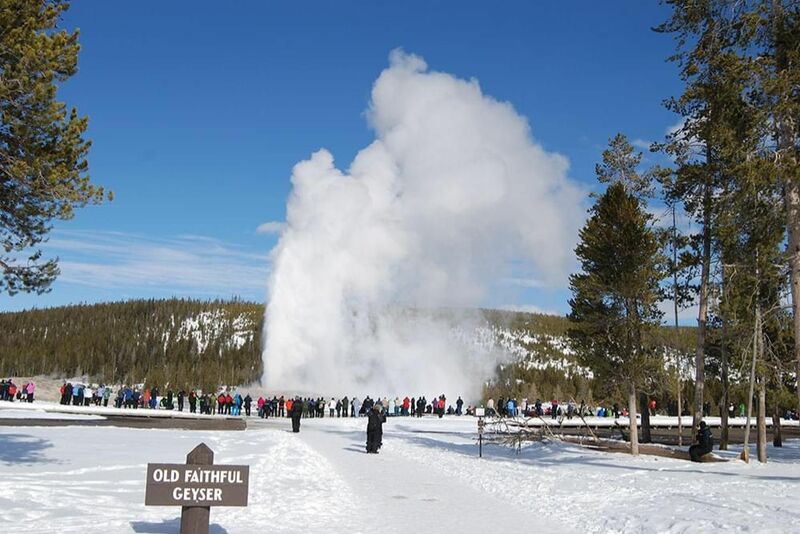 During the Old Faithful portion of the tour, your tour guide will give you plenty of time to both eat lunch and walk Geyser Hill located adjacent to the Old Faithful Geyser. Make sure you leave time for the Old Faithful Visitor Education Center. Many call this the waterfall tour in anticipation of the many waterfalls you'll be passing by. The most spectacular are the Lower Falls with a 308 foot drop. The other falls include the Crystal Falls (129 feet), the Upper Falls (109 feet) and the Gibbon falls (84 feet). Additionally, you'll pass through the Norris Geyser Basin which is the hottest and most acidic basin in the park. Many say it has the look of a desolate moonscape. 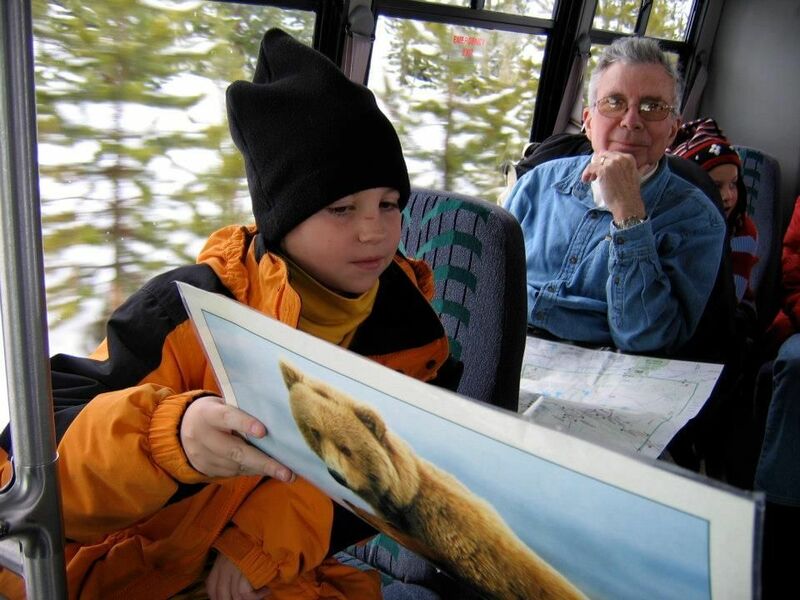 Most snowcoach tour operators in West Yellowstone offer custom or private tours. Select this option if you're looking for a one-of-a-kind experience for you and your party. You can design the perfect tour for company outings, wedding parties, family reunions, friendly getaways and more! Be sure to ask your snowcoach tour provider for specific features or scenery you have in mind. Your custom tour can be tailored to meet almost any need. Yellowstone snowcoach tours almost always feature the opportunity to explore the outdoors, so for maximum enjoyment you'll need to stay warm. You are going to want to dress in layers because there will be a vast temperature difference between the coaches and outside. Bring along your most comfortable and warming winter gear, including thermal undergarments or long-johns, a hat, gloves, earmuffs, and winter ready footwear. Don't forget your sunglasses for avoiding the light glare from the reflected sun. Snacks, nonalcoholic drinks and binoculars, while optional, are helpful. Since most tours do not provide food or drinks, you'll want to bring your own sack lunches and snacks. The Old Faithful tour is the only tour that offers a food concession stop, but even here we recommend a bagged lunch to save time for more sightseeing. Bring important medications and other must-haves along with you to your snowcoach tour, as once the tour has started it's very difficult and complicated to have to return to the starting point. Additionally, cold temperatures zap camera batteries, so bring extra ones and keep them warm inside your pockets. As the west entrance to Yellowstone National Park, West Yellowstone, Montana is the most popular gateway to Yellowstone. West Yellowstone is located eight miles from Idaho and two miles from Wyoming. This bustling little town offers a rich local community and plenty of activities to discover outside of the Park. Explore their restaurants for a variety of dining options; experience taverns with live poker tournaments, and multiple quaint shopping opportunities. Many tours around West Yellowstone include extensive information about its incredible wildlife, including bison, wolves, eagles, and elk. Additionally, West Yellowstone features dealers for all the popular snowmobile manufacturers (Polaris, Ski-Doo, Arctic Cat and Yamaha) Throughout the winter, there are several special activities such as Kids-N-Snow, ice fishing tournaments, dog sled races, and Nordic Ski races. At the end of the winter season, the town holds its annual Snowmobile Expo and Powersports Show, featuring racing, snowmobile gear vendors, a sneak peek at new snowmobile models, special exhibitions and more. 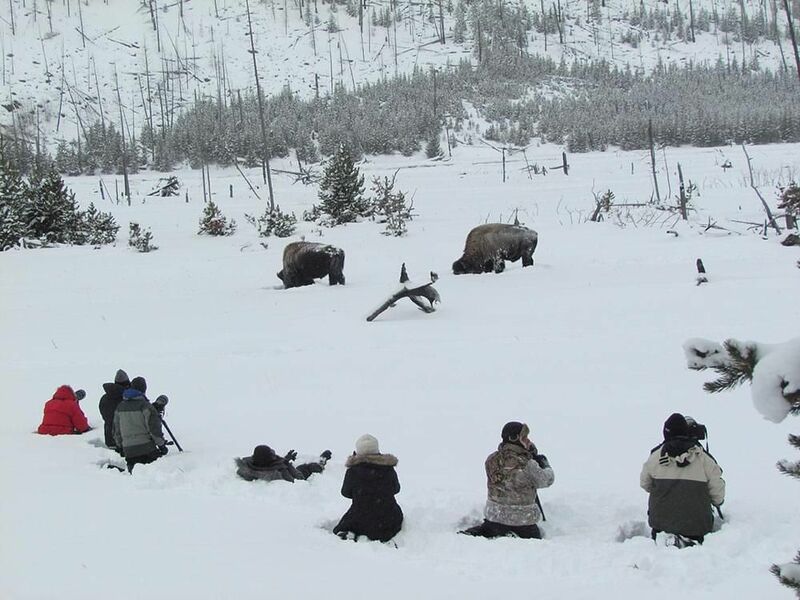 Yellowstone Park's winter season starts around December 15th and ends around March 15th. In December, all interior roads are left to snow over in preparation for winter tours. Expect more booked tours the week between Christmas and New Year's, but availability should be more amenable before and after the busy holiday season. January is typically the park's coldest month, and March is its expected warm month  warm being a relative term! As with any snowy region, there can be extreme highs and lows in temperatures, but most weather will range between -15 and 30 degrees Fahrenheit. Your snowcoach will be heated, but prepare to dress warmly, and in layers, for the outside portions of the tour. When travelling to and from Yellowstone National Park, it’s important to stay close for easier transportation. Located in the center of West Yellowstone, The Brandin’ Iron Inn is only two blocks away from Yellowstone National Park’s West Entrance. 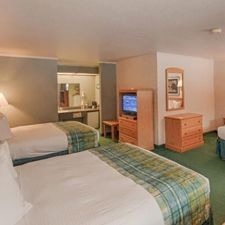 As proud three-generation West Yellowstone locals, the hotel has since partnered with several popular Yellowstone National park vendors to offer park tours that have been designed meet the specific needs and desires of our guests.